Edit any scanned document without loosing anything. 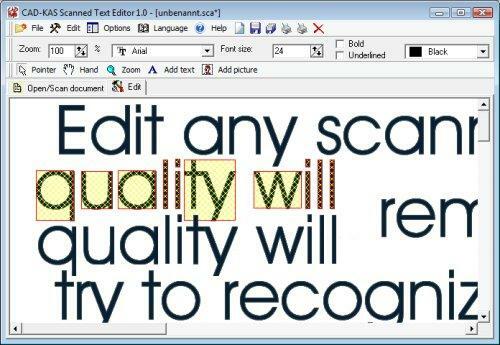 Layout and quality will remain as in the original document. The program will NOT try to recognize the text, instead it will free the characters and pictures from the background and place it as free moveable objects over the background. You can open existing documents (bitmap pictures) or scan new documents. You can then move, delete, copy and paste text and pictures or add new text and pictures. You can save the result as bitmap picture or print it. To save the document in the internal file format SCA is also an option. In this format all objects wll be saved in it's own layer without melting again with the background. View a video how it works! 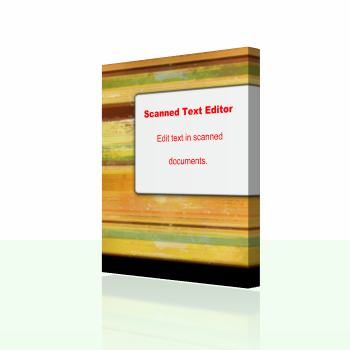 If you want to try an OCR character recognization you can use OCR TextScan to Word.